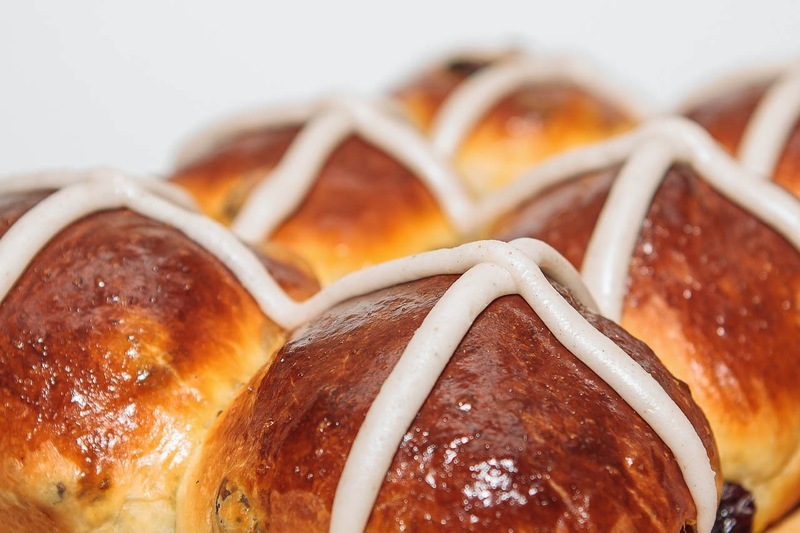 I wasn't familiar with hot cross buns before making this recipe, so I did some research. 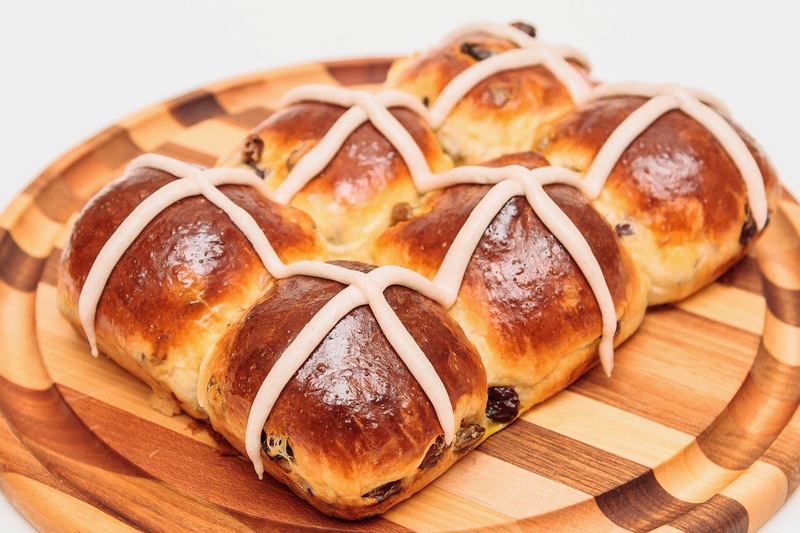 Apparently, they are traditionally eaten on Good Friday, and the superstition is that if you make them entirely on that one day, the buns will never go bad or get moldy. Also, at one time, it was illegal in England to make or sell them any other day than Good Friday. Interesting! These are simply little brioche buns studded with currants and cranberries, and topped with a "cross" of cinnamon cardamom icing. The brioche dough does not need to be made the night before, but it does require a lot of proofing time, about 3 hours total. So set aside some major time, or get started really early in the morning if you want these for breakfast. The dough was fun to work with, kneading the fruits into the dough, and shaping it into little balls. 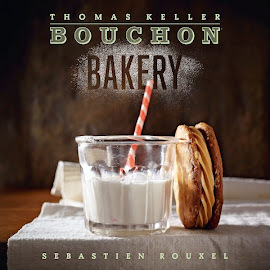 Our trip to Bouchon Bakery really prepared me for this, since we got to see them shaping dough using the same technique. Finally, after much rising, the buns were ready to bake. Again, the heavenly smell started filling the house, and I was getting excited to try these. After cooling completely (which was torture), I added the frosting crosses and tore into one. The buns were light and fluffy, and the little bits of fruit were a nice contrast. It almost reminded me of panettone, the traditional Italian Christmas fruit bread. I wonder if I could adapt this recipe? The little bit of frosting was just enough sweetness and spice. I could eat the whole dozen! I will definitely make these come Easter time. 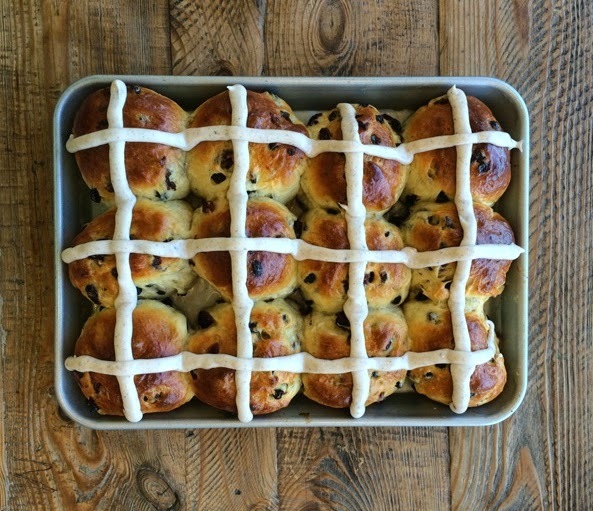 This was a different approach to hot cross buns. I have never had them a brioche before. My one complaint was running your mixer for 30 minutes? Wow!! I didn't. I think I let it run for about 10 minutes. I did however let the dough rest in the fridge over night. Not that you needed to, I just was trying to conserve time. Next morning I let them sit our for an hour or so. They rose beautifully in the oven. I did have to substitute what I had on hand. I used golden raisins and orange zest. I loved the flavors. Also, got the paper baking pans from Sur la Table so that I could make these as gifts. This is a great recipe, other than 30 minute mixing time. These cross buns turned out delicious. They reminded me of rolls from my childhood. I was amazed how easy they were to make and was pleased I could make them the same day I made the dough. I did have two concerns; I thought there were too many currents and cranberries in the dough and second was the dough turned out loose. I double checked the instructions but I followed everything correctly. I forged on and put the dough in a bowl for 45 minutes to rise. I studied the folding method of the dough months ago so when it came time to stretching and folding, it became an easy task. After the second rise of the dough, it became manageable to make into rolls. Taking a bread making class with Matt McDonald made all the difference in knowing the process of handling the dough. Rolling out the balls of dough for each individual roll was also easy as I remembered Matt had shown our team on a visit to the bakery how to roll a baguette. The method is cupping the fingers around the dough and gently rolling with the palm of the hand. It is now second nature to me. What I had not known before making these buns was the importance of brushing the egg wash on gently on proofed dough. I would normally just slap the egg wash on like it was nobody's business. I baked the rolls for 20 minutes and let them cool. I piped the icing on the buns and the icing somewhat melted as the buns were not completely cooled. We each had one and enjoyed how tasty they were. The amount of currents and cranberries was perfect! I love the cardamom and cinnamon together in the icing. My family already requested a second batch. I will make these many times! 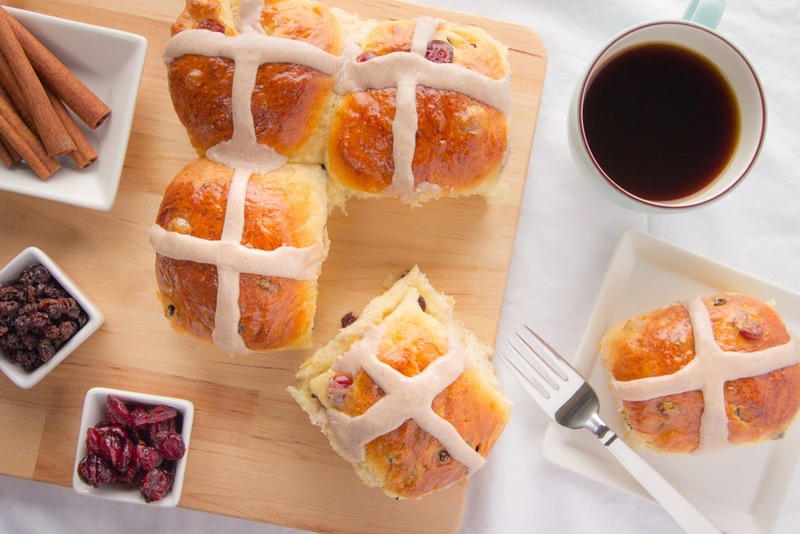 The was my first time eating and baking Hot Cross Buns and I'm happy to say it was a great food experience. The dough was very easy to work with and flavor was wonderful. The hard part was waiting for buns to cool completely before applying the delicious icing! The only adjustment I made for the dough was for the second proofing, I did a slow proof overnight in the fridge. I just didn't have the time to do the whole project in one go so it was helpful to break it up in two stages. The next morning, bright and early, I shaped into the individual buns, let them rise and then baked them off. I wish the buns got a little bit rounder and filled more of the space between each bun. I did let them rise for 1.5 hours in a rather warm apartment. As for the icing, I loved the addition of the cardamom. I had whole cardamom pods that I ground with a mortar and pestle and the aroma was lovely. It is quite strong in the icing but when eaten with the bun its just the right amount. Note, the icing is quite stiff but it is necessary if you want it to hold like shown in the photo. The buns were beautifully golden, fluffy and perfect amount of currants and cranberries so they were present in every bite. More on her blog! I’ve never made hot cross buns before. I have always been less than impressed with the ones in the grocery stores and thus never really had any interest in making them. Then I saw this recipe and the thing that caught my eye was the cardamom in the icing. I love cardamom. I didn’t have currents and cranberries on hand but I did have golden raisins and dried cherries. So I made that substitute. Other than that I made them just as the recipe directs. I only show twelve in my image because I saved half the pan in the freezer (before icing) for Easter. I found the dough to be quite stiff before adding the butter. I have made brioche a few times before from other recipes and I found this to be a difference. I was concerned that it would make integrating the butter difficult, but it all worked out fine. Once the dough was mixed with the butter I found it to be very loose, looser than the other brioche doughs that I have worked with in the past. I found that interesting too. It didn’t create any problems, I just thought it was worth mentioning since I noticed it. The end result was wonderful! They were so light and pillowy I made myself eat two…. they are rich, and so deceptively filling. I guess it must be all that butter! The cherries and golden raisins made a wonderful substitute, I will use them again since I like cherries much more than cranberries. Perhaps I will try currents and cherries next time since I have no particular attachment to golden raisins. Happy Easter!